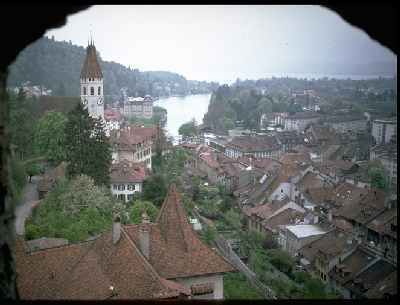 ABOVE: A view toward the lake from Schoss Thun. Thun (pronounced "Toon") isn't just another cow-infested Swiss village. It's a city of nearly 40,000 that has occupied an important role in cantonal affairs since the Gentlemen of Bern acquired it from the House of Kyburg in 1384. The city is located at the northwestern corner of Lake Thun (Thunersee), where the River Aare flows out of the lake on its 24-mile journey toward the Swiss capital of Bern. It offers frequent train and boat service to nearby Interlaken, the hub of the Jungfrau region, yet it's only a 20-minute commute from Bern. Trains also head south over the Loetschberg Pass to Brig, which offers easy railway connections to Italy and the popular Glacier Express between Zermatt and St. Moritz. 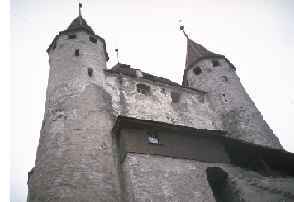 In short, Thun is both a transportation hub and a convenient base for city and mountain excursions. In front of the ch�teau the limpid trickle of a fountain drips steadily into a round basin. We get a glimpse of a bit of wall with chestnut trees shedding their blossom; the bold square tower with its four round turrets, capped by conical roofs, stands out with a certain dignity, but not so proudly as the Stockhorn which man aped when he built these towers. Watchtowers at the four corners of the cemetery afford wonderful views of the lake and the snow crowned peaks in the distance--the Bl�mlisalp, the Jungfrau, the M�nch, the Eiger, and the Schreckhorn. Who can doubt but that the souls of those buried here are ever looking down from those crests upon the quiet places they once loved so well! Although Thun is no longer the "little town" of Guiton's day, its urban center hasn't changed dramatically over the last half-century. The Rathausplatz still has a massive 16th Century city hall, and the businesses on the Hauptgasse continue to be arranged on two levels, with the sidewalks outside the upper-story shops serving as an arcade for the stores at ground level. 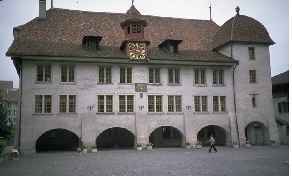 ABOVE: Thun's Rathaus, or City Hall. Vaporama, the Swiss Steam Engine Museum, with paddlewheel steamboats and antique locomotives from mountain railways. Kuntstmuseum Thun, housed in a former grand hotel on the Aare River, has a large collection of modern paintings, sculptures, and photographs. Thun Panorama (formerly the Wocher-Panorama), a pavilion in Schadau Park where you can see a panoramic painting of Thun as it looked in 1810. Schloss Oberhofen, a handsome castle in a beautiful setting on Lake Thun. The castle is a branch of the Bern Historical Museum, with a collection of period furniture and displays on local life in earlier times. You can reach the castle by lake steamer and hike back to Thun along the shore. This regional tourism site focuses on villages and attractions outside the city between Thun and Interlaken.